Thailand, Vietnam and many other countries. There is also a section dedicated to the cameos of Torre del Greco and to mother-of-pearl. Books, stamps, old malacological printings, jewels and other articles made with shells are also available. 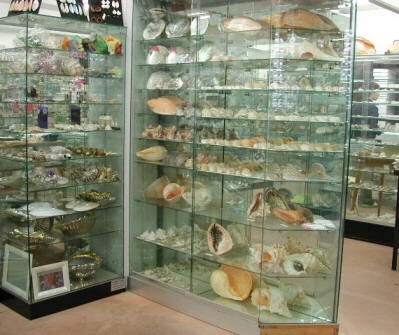 The naturalistic variety of the shop includes also fossils and minerals. There is also a malacological boutique providing ties, handkerchiefs, scarfs all decorated with shell subjects and hand made in best quality silk. The shop has the same opening timetable of the exhibition. Main credit cards and currencies are accepted.